vegetarian one pot pasta recipe - making veg pasta in one pan is an easy method and takes less time as compared to cooking pasta with the traditional method. firstly rinse, peel and chop all the veggies. chop onions, garlic and tomatoes finely. also chop the carrots, capsicum, french beans in small pieces or cubes so that they cook faster. in a mortar-pestle or in a small grinder take 15 to 20 cashews. crush or grind to a fine powder. keep aside. heat 2 tablespoons olive oil. keep the flame to a low and then add 1 teaspoon finely chopped garlic. stir and saute garlic for a few seconds. then add chopped onions. stir and saute onions till they turn translucent. next add finely chopped tomatoes. mix very well and begin to saute tomatoes on a low to medium-low flame. stir often when cooking tomatoes. the tomatoes should turn pulpy and soften. you should also see some oil releasing from the sides. then add crushed black pepper and mix. now add the chopped veggies along with the frozen green peas. mix well and saute veggies for a minute. then add salt as per taste. add 2.5 cups water. if you want a slightly soupy and saucy pasta, then add 3 cups water. mix well and cover the pan with a lid. cook the veggies on medium flame for 7 to 8 minutes or till the entire mixture comes to a boil. then add the pasta. you can rinse the pasta before adding. mix again and cover the pan with lid. simmer on medium flame till the pasta is cooked. in between do check when the pasta is cooking. give a stir and continue to cover and cook. if the pasta starts sticking to the bottom of the pan, then add some water. simmer till the pasta is softened and cooked well. if there is any water left then continue to cook without lid till most of the water evaporates. then add the cashew powder, dried oregano and chopped basil leaves. you can also add italian seasoning or your choice of fresh or dried herbs. mix well. check the taste and add more herbs, salt and pepper if required. at this step you can also add some cream in the veg pasta. 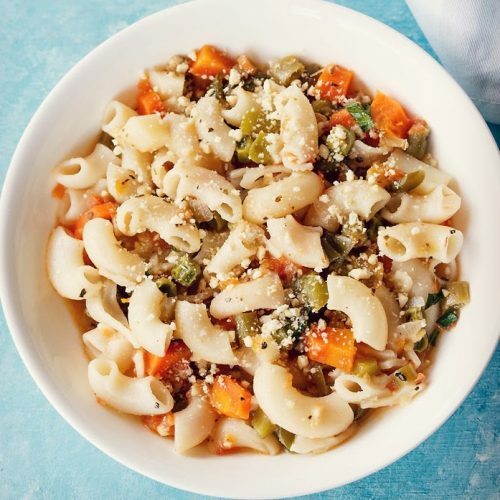 serve one pot pasta topped with some cashew powder. you can also top it up with a bit of cream or grated cheese.